Kara dedicates her practice to resolving complex intellectual property disputes involving patents, trademarks, copyrights, rights of publicity, trade secrets and unfair competition. 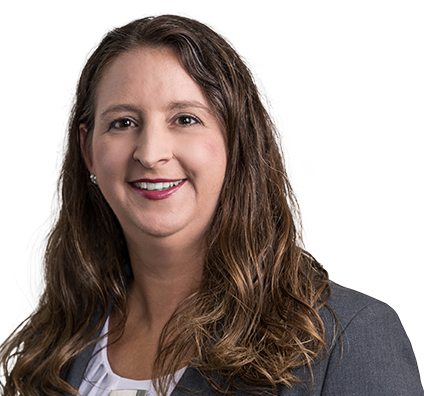 She works directly with in-house counsel, engineers and business professionals to defend accused companies and enforce their intellectual property assets. This includes forging aggressive litigation strategies and, when necessary, developing cost-efficient strategies for avoiding and reducing the risk of future litigation. Serving on the team that represented Octane Fitness, LLC before the U.S. Supreme Court in its patent infringement case, a case that altered the balance of power in patent litigation. Representing clients in turning back Major League Baseball’s attempts to control the fantasy sports industry. Represented several subsidiaries of a Fortune 500 manufacturer in a consolidated Eastern District of Texas patent infringement suit brought by a large and well-financed Canadian patent troll. Multiple claims of five different patents were asserted primarily against the subsidiary that engineers and markets a distributed control system for plant automation and process control. Previous assertions of the same patents had resulted in multi-million dollar settlements from large process control companies. Our team extensively briefed and argued motions challenging the validity of the patents under two lines of cases, one requiring software patents to claim implementation on a fixed and tangible medium and another under Alice, a 2014 Supreme Court decision that invalidated patents using conventional computer technology to claim and preempt an abstract idea without adding anything inventive. Our team also had the foresight to challenge venue and transfer in anticipation of the Supreme Court argument in TC Heartland and the Federal Circuit decision in In re Google. In March 2017 the District Court accepted our client’s invalidity arguments and dismissed most claims. As a result, the plaintiff dismissed the few remaining claims to appeal the District Court’s order to the Federal Circuit, thus enabling a cross-appeal of venue and transfer rulings and further wreck the troll’s business model. Served as member of team providing lead counsel representation of Octane Fitness, LLC (Octane Fitness, LLC v. Icon Health & Fitness) before the U.S. Supreme Court in its appeal of denial of attorneys’ fees in a patent infringement case. Obtained summary judgment on infringement claims against Octane Fitness and the District Court denied fees. Merits and reply briefs to the U.S. Supreme Court were authored by the team and joined by numerous amici, including the U.S. Solicitor General. In Octane Fitness, LLC v. Icon Fitness and Health, Inc., the Supreme Court reversed the Federal Circuit and set a totality of the circumstances standard for finding exceptionality to award fees under 35 U.S.C. § 285. The case garnered significant national media attention and altered the balance of power in patent litigation. On remand, the District Court found the original claims against Octane Fitness exceptional and the team secured a fee award of $1.4 million for the client. Represented CBC Distribution against Major League Baseball. On First Amendment grounds, CBC defeated Major League Baseball’s claim that the use of player names and statistics in fantasy baseball games violated player rights of publicity. The case ended with the Supreme Court denying certiorari. Filed amicus brief on behalf of Fantasy Sports Trade Association in Indiana Supreme Court case Akeem Daniels, Cameron Stingily and Nicholas Stoner v. FanDuel, Inc., and DraftKings, Inc. Court issued unanimous ruling in favor of FanDuel and DraftKings. Represented Wolff Shoe Co. in a copyright infringement case involving an ornamental design on a shoe. The jury award to Wolff of $2.2 million in actual damages was notable because the defendant had sold only a limited number of infringing shoes. Counseled CBS in a matter brought against the National Football League Players Association. On First Amendment grounds, CBS defeated the NFL’s allegations that the use of player images and names in fantasy football games violated player rights of publicity. Member of team counseling Synergetics in a trade secrets case involving laser products used in vitreoretinal eye surgery. The team obtained a jury verdict awarding $2.3 million, including a punitive damage award. Verdict was upheld on appeal. Defended ‘745 LLC against patent infringement allegations brought by Gibson Guitar regarding a virtual music reality system. After a Markman hearing, ‘745 secured a claim construction ruling construing four terms in ‘745’s favor.Gibson filed a dismissal with prejudice following the ruling. Successfully defended Western Excelsior Corp. against claims of patent infringement and trade dress infringement of the product appearances. The patented technology involved soil erosion fabrics, their chemical composition and methods of manufacture. Plaintiff sought a preliminary injunction, which was defeated. Following the Markman hearing, Western Excelsior prevailed on all three claim terms in dispute. The plaintiff dismissed its lawsuit with prejudice. Defended Nations Mortgage when a national bank sued it for trademark infringement of its Legacy Nations Bank trademark, including color schemes of the mark. Assisted Nations Mortgage in developing an abandonment defense that had implications for the plaintiff’s mark, as well as several of the legacy marks. The plaintiff agreed to a confidential settlement, despite Nations Mortgage having no claims against the plaintiff.